 Tågset typ DB med tungt ånglok och 5 godsvagnar "Vädrad"
Tågset typ DB med tungt ånglok och 5 godsvagnar "Vädrad"
By buying this product you can collect up to 3997 bonuspoints. Tågset typ DB med tungt ånglok och 5 godsvagnar, totallängd över buffertar 360 mm. Limiterad i 499 exemplar med certifikat, vädrad. 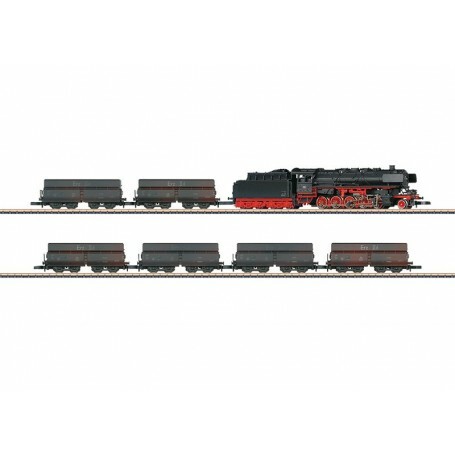 Model: The locomotive is visually improved and has a 5-pole motor. The locomotive and frame are constructed of metal. All of the driving axles are powered. The locomotive has finely detailed, working valve gear, imitation brakes are modelled, and the locomotive has triple headlights. The locomotive is weathered. All of the cars have their own car numbers and weathering.Total length over the buffers approximately 360 mm / 14-3/16'. The set is limited to 499 pieces. It comes with a certificate of authenticity. Prototype: German Federal Railroad (DB) class 44 steam locomotive with Witte smoke deflectors and a coal tender, 6 type Ootz 43 hopper cars. The locomotive and cars look as they did in Era III. Finely detailed models with weathering. Locomotive visually improved.Limited to 499 pieces.